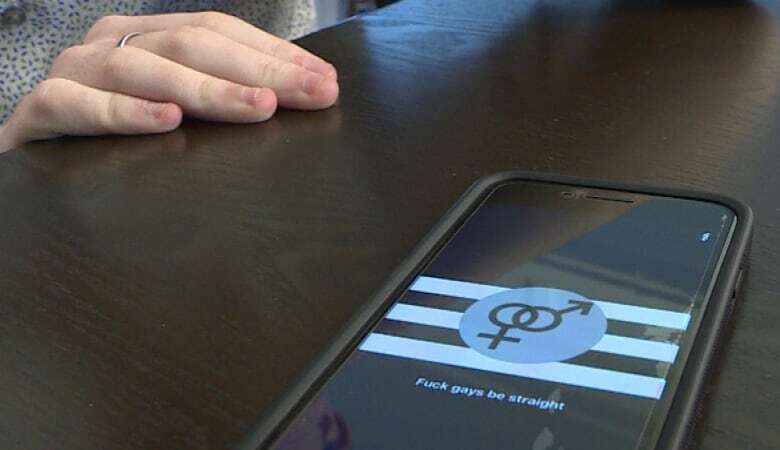 Members of a Gay-Straight Alliance in central Newfoundland say their club was targeted by harassment, bullying and threats of violence. "They were saying they wanted people to die. 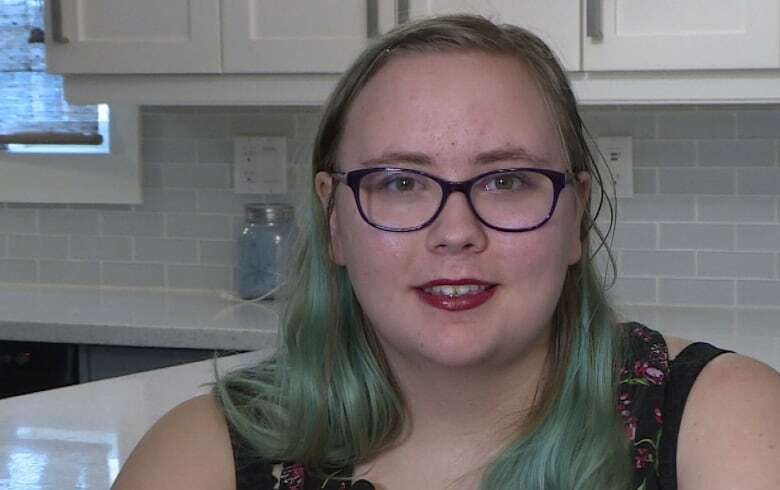 They wanted to throw us in a box, light us on fire and throw us out in the river," said Ashley Hoskins, a Grade 11 student at Botwood Collegiate. She said the harassment has worsened over the past two weeks and now "pretty much a civil war started in the school," between the Gay-Straight Alliance (GSA) and students who are insulting them. "There were a lot of people who took a week or more off of school because they were feeling that threatened being at school," she said. Hoskins said the comments started on social media, and that they have been mostly confined to a group of about 10 students. She said discipline imposed by the school staff hasn't stopped them. "They've been suspending students, they used to come back, start doing the same things. They just suspend them again," added Daniel Peckford, a founder of the club. The chief executive officer of the Newfoundland and Labrador English School District called the issue "abhorrent." "The reaction is almost visceral. It's really unfortunate," Tony Stack said Wednesday. He pledged the district would do anything it could to support the GSA and its students, calling the school's inclusion policies "non-negotiable." "We will engage whatever means within our scope, in terms of discipline. We can resort to expulsion, ultimately," he said. "Some of this stuff may breach into the criminal aspect, and we can continue to apply suspensions and some proactive restorative justice measures as well." In a statement, Newfoundland and Labrador's English School District said the issue was being dealt with by school administration. "The response has, to date, included the imposition of school-based discipline — the details of which we are not at liberty to disclose," wrote Heather May, a spokesperson for the school district. The conflict started after school officials posted a standardized rainbow flag poster — a common one found in many public buildings in Newfoundland and Labrador — on the school walls. 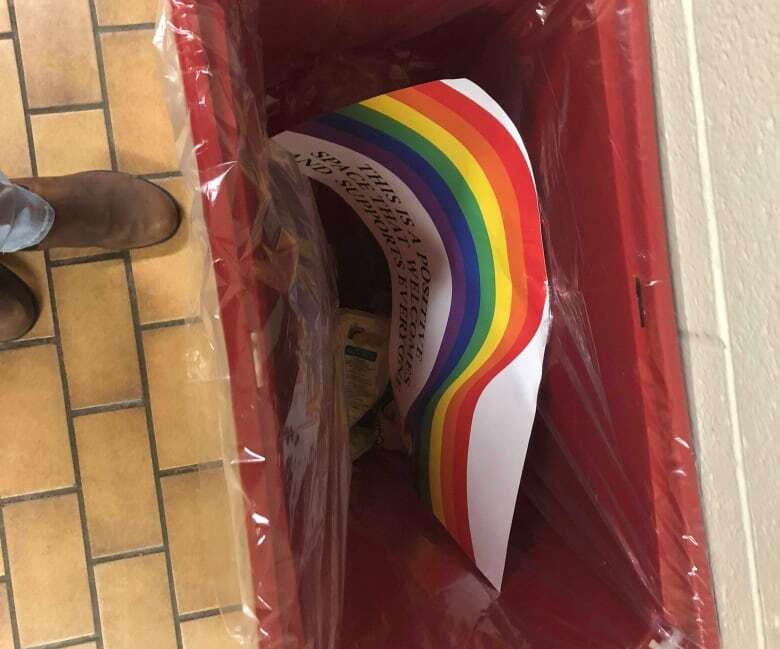 Peckford said some students started to cover up the poster, "saying, 'gays are not welcome in our school, they're stupid, they shouldn't be allowed.'" 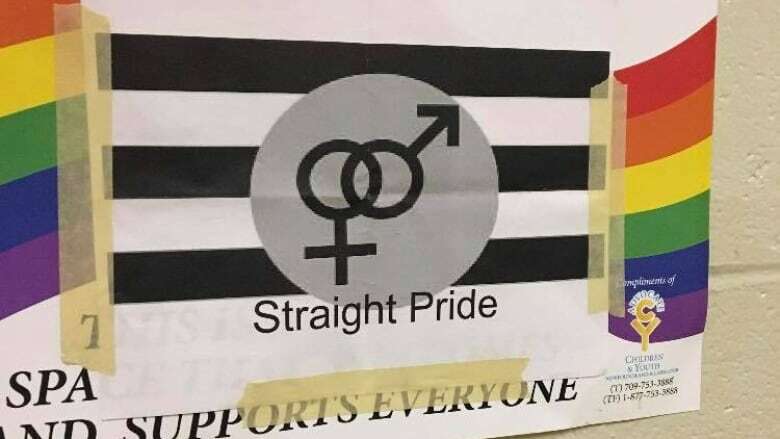 At one point, some students taped a "Straight Pride" poster over the poster, and it has also been thrown into the trash several times. Hoskins said members of the group started to informally guard the poster by standing next to it. 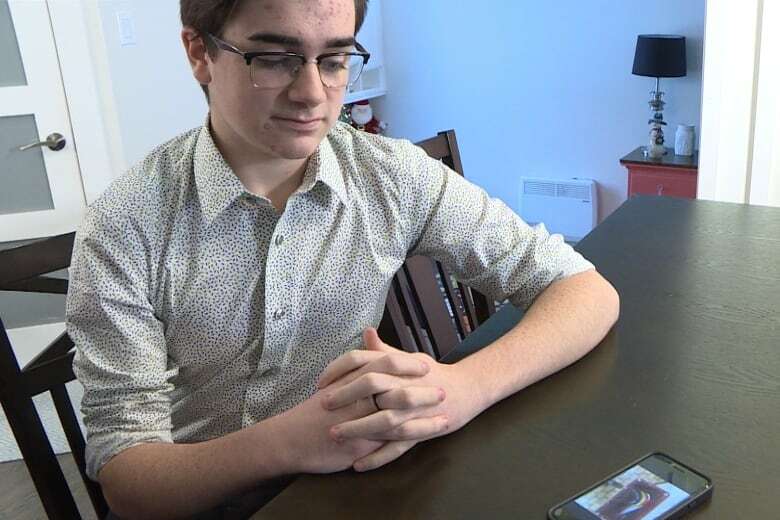 Peckford said he was hurt — and baffled — by the suggestion from some students that "straight people don't feel included anymore." "I don't feel like that," he said. "The homophobia in our school is really bad. I don't think anyone is being bullied for being straight." While Hoskins said she hadn't been the direct target of the abuse, she said she still feels worried about her safety in the school, and others do too. "I mostly just ignore them, but I know one of my friends who definitely has the 'lesbian look,' she's always called a dyke, every time she walks down the hallways. Even before the whole GSA thing, she couldn't walk down the hallway without being called names." Peckford said school staff members have been supportive of his group from the beginning — and the school will hold classroom sessions this week to talk about their inclusion policies. The students also said some peers have rallied to their side, after seeing the insults hurled at them. 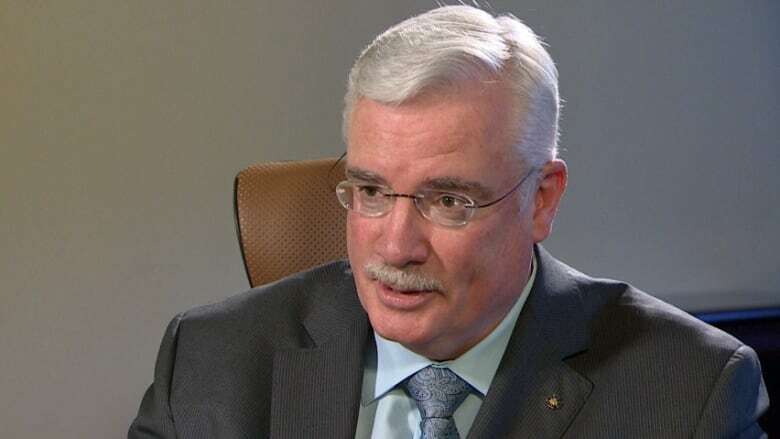 Stack said he believes the Newfoundland and Labrador government policies are working, broadly, "but some attitudes in certain pockets seem to prevail." "I believe ultimately what's going to change regressive attitudes and little pockets of hate is education." The school district said it's planning a "longer-term response" that includes "ongoing education, training and district support around inclusion and diversity, including LGBTQ-related issues." 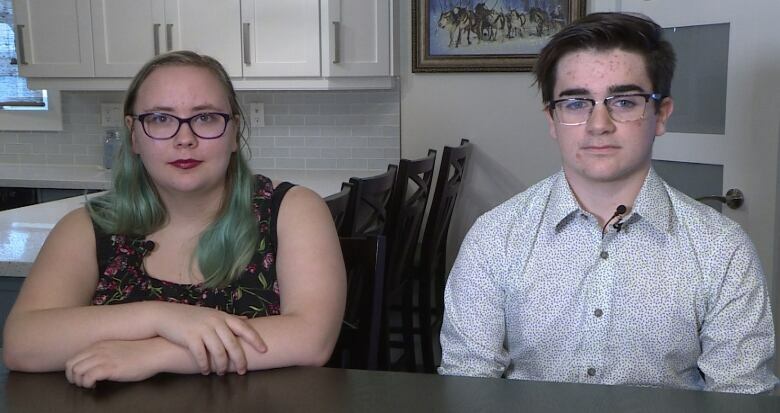 "I think we can start educating them," said Peckford, "telling them why it's so hurtful to say these things."